Does this Work scenario sound familiar to you? The staff responsible for the interviewing often are removed from interaction with this generic recruitment process. It’s as if there are separate SILOS within the Organisation and little consultation occurs between the Divisions and the HR department, which should be providing strategic guidance. How can iWAM and Models of Excellence transform the HR System? iWAM and Modelling excellent performance technology provides a simple and integrated system, based on the measurable and proven ways of thinking and acting that lead to high performance. Once a Model of excellent performance has been done, the critical thinking styles and behaviours move through every HR area, integrating, simplifying and facilitating inter-communication, lowering wasted resources and most of all dramatically increasing individual and team performance. Because it takes the guesswork out of all the HR processes, as what is critical to success is known and reinforced by all areas. Selection: The job advertisements can be written with a language and style that is congruent with the thinking patterns of the high performers. Others who are not suited will unconsciously be not attracted to the ad. From Day 1 you know the appointee’s areas of strength and weakness for the role. 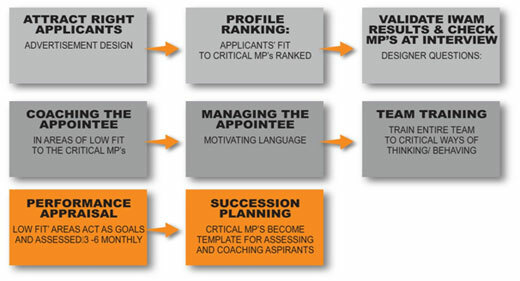 The iWAM Comparison to the Model Report will give specific information on how to coach the appointee in areas of `misfit’ to the critical thinking patterns. So there are no surprises in 6 months. No more scattergun programs hoping they will somehow `hit the spot’ and increase employee performance and satisfaction. 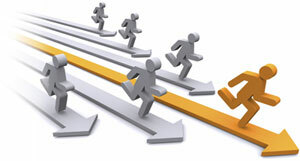 Team trainings are based on teaching strategies based on the critical thinking patterns for success. Individuals are assessed against the critical ways of thinking (eg goal orientation, or attention to detail or focus on people). Where there is deviation from the critical ways of thinking and behaving, they become goals to be achieved and assessed in the next assessment period. Who do you interview? Who do you appoint? How do you save company time, money and resources in recruiting? How do you assess the effectiveness of staff? How do you know how effective the training has been? How do you reconcile differences in teams?